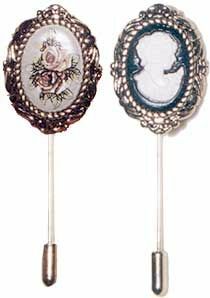 Take advantage of the wide range of decorative buttons available these days, and make a unique stick pin in a cameo or roses theme (or any theme that strikes you as particularly beautiful or meaningful). These pins can be assembled quickly and make lovely gifts. These beautiful pins are very easy to make and inexpensive too. Look at the photos at right for assembly details. Photo 1 shows the type of pin used for these and Photo 2 shows how to assemble the buttons and the pins. The bead at the centre back of the button is used, because the button is a two part button and rather than cutting off the button loop, I decided to attach a bead over the loop, to level the button back. You can cut the loop if you like and secure the the two sections of the button together with a little glue. Glue the pin assembly to the back of the pin as shown in diagram 2. Allow your glue to dry at least 24 hours before wearing these pins. These make wonderful presents for Mother’s Day!